Quick and easy access to an index of over 1100 minute books between 1865 and 1910. From the Taitokerau, Waikato-Maniapoto, Tairawhiti, Waiariki, Aotea, Takitimu, and Waipounamu Māori Land Court Districts. Index only. 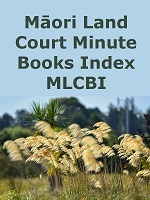 The MLCMBI is an index to the volumes of Māori Land Court Minute Books produced by The Māori Land Court — Te Kooti Whenua Māori. The Māori Land Court Minute Books contain judges' notes on court sittings from 1865 to 1910. These sittings covered court proceedings to do with succession and ownership of land, as well as, in some cases Māori to Māori adoptions. They contain a good deal of whakapapa information and may be useful for whakapapa researchers to consult. Although this index covers minute books for the whole of Aotearoa New Zealand, Christchurch City Libraries holds copies of only the South Island, Chatham Island, Titi Islands and Wellington & South Island appellate books. These may be viewed at the Ngā Pounamu Māori Centre on Tuakiri | Identity, Level 2, Tūranga. A full run of published minute books from around the country are held locally by Macmillan Brown Library at the University of Canterbury. Although these are primarily supplied for the use of Canterbury students they are also able to be viewed by the general public. See here for a full list of Macmillan Brown minute book holdings. Local Māori Land Court offices hold paper copies of minute books relevant to their region. The Māori Land Court office also supplies access to digital images of books for other parts of the country. Those interested in accessing information on more recent cases and decisions should also contact their local office. A rich resource for perspectives on major contentious social, political, and technological issues that are relevant to New Zealand and Australia. Use Australia / New Zealand Points of View Reference Centre now. Find out about Australia / New Zealand Points of View Reference Centre.